Get yourself an opportunity to learn traditional Shaolin Kung Fu under warrior monks at Buddhism temple in China. This best location provided with Buddhism atmosphere to allow you to feel the essence of Kung Fu. This kung fu academy is a big family that follow the traditional training methods which related to lifestyle, fitness, cultivation, and mentality. This training also engage in developing comprehensive and practical traditional martial arts skills of students from all around the world. Students get motivate to realize own potential and to be the best of themselves. During this training, you will be accommodated in shared room (two person room) or single room at students’ choice. All rooms have private toilet and hot shower. There are extra mattress and blankets that students can ask for if needed. It is very convenient to live in the temple with free Wi-Fi covering the whole temple area, laundry room with automatic washing machine, etc. Below is the schedule of the training. Class times change slightly with the seasons. Kungfu Xinglin puts the standard and quality of training in the first place. The training will take place from Monday to Friday. Shaolin Kung Fu originates from ancient times that can be traced back to around 1500 years ago. It has preserved more than 700 complete forms that came down the ages. Shaolin Kung Fu is famous for its cultivation of both Chan Buddhism (Chinese Zen) and Kung Fu. It is a peculiar system with a rich practical experience of the Shaolin warrior monks and historical evolution behind. Benefits of Shaolin Kung Fu include improvement of one's constitution and flexibility, increasing the adaptability to a new environment, cultivating one's mind, getting more motivation in life, and anti-aging. From the experiences of students who had trained at the academy, Kungfu Xinglin can tell that Kung Fu not only made their mind and body stronger but psychologically prepared them for all the new experiences. The remarkable characteristic of Wing Chun is the “center line” attack theory, which means to attack the center of your opponent’s body. In sparring, you concentrate on your opponent and attack continuously in a straight line, which is the nearest and fastest way. Wing Chun uses “inch force”, a kind of internal force with short, clear, and explosive power. Based on sparring, Wing Chun moves are resourceful and practical. You hold fist and sink shoulders and arms, in order to protect chest and crotch. Basic steps Zhui Ma and Shan Ma are used to riposte and dodge. The main fist forms in Wing Chun are 36 San Shi (36 different attack and defense moves), Xiao Nian Tou (little ideas), Xun Qiao (seeking bridge), Biao Zhi (quick offensive and defensive skills), and Wooden dummy forms. As a style of Neijia Fist, Tai Chi absorbs the quintessence of Chinese classical philosophy and traditional Chinese medicine theory, making it a physical and mental exercise emphasizing natural harmony and balance, and spiritual integration and attainment. Tai Chi moves are featured by their relaxation, slowness, coherence, coordination, attentiveness, following an arc to move, and the method of breathing. The attack skill of Tai Chi is Protector's Strike, which is like “away the rock with water”. Following the principle of yin and yang, Tai Chi achieves a balance in both moves and attack skills using the received force to break up the coming force. Mainly, there are two styles of Shaolin Qigong: Neigong (soft Qigong) and Waigong (hard Qigong). Qigong helps the vital systems to cope with the impact of stressful and polluted daily environment. If your internal organs function properly, your health will benefit tremendously. You can become more productive when relaxed under pressure. Qigong exercises are designed to enhance the flow of Chi and regulate the internal balance. 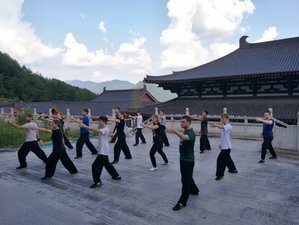 Kungfu Xinglin are constantly engaged in providing unique opportunities in motivating character development during training. In order to ensure the teaching quality, every master is supposed to teach five to ten students in his group. Kungfu Xinglin offers individually customized and scientific training plan according to student's training goals and physical conditions. Kungfu Xinglin provides a broad selection of Kung Fu styles for students' choice. You will benefit from the most original and practical training methods and fighting techniques from the Shaolin Temple. Training lessons will include Shaolin basics, Shaolin forms and applications, sparring forms, acrobatics jumps and rolls, Wing Chun, Qin Na, Tai Chi, Baji Quan, conditioning, and others. There will also be Qigong and meditation training as optional courses in the early morning and group training at different training stages. Training equipment will be provided to all students, including wooden dummy, stretching lanes, carpet, mats, Sanda pads, gloves and guards, weapons, dumbbells, stone dumbbells, and sandbags. To improve flexibility, speed, strength, agility, coordination, and physical endurance, proper running, stretching of important body parts, kicks, punches, and stability training including horse stance, bowstance, crouching stance, one-leg standing, are the foundation of more advanced forms and techniques. For students who have better skills and learn quickly, Kungfu Xinglin can teach them as much as they want to learn. It is recommended for students to do some preparations before coming, as training will be intensive. Stamina exercises like running, swimming, cycling, or other forms of exercise, are good ways of physical preparations. Exercises to improve flexibility and strength are also helpful, such as stretching and gymnasium exercises. If before arriving, you have not done any physical activity, you should expect to have some muscle pain. This is normal for the first week of training and will pass very soon. Master Shi Xing Lin (Master Zhang), 36 years old, a 32nd generation Shaolin warrior monk, ranked at level 7. He went to the Songshan Shaolin Temple in the year 1993 and stayed there for 15 years. In this duration, he changed his role from a learner to an experienced Kung Fu master. He specializes on the 72 Shaolin Secret Skills: hard Qigong “iron head” and “silver throat”. He is good at traditional Shaolin fist forms, Shaolin staff, swords, eagle fist, tiger fist, mantis fist, drunken fist, Wing Chun, Qin Na, Tai Chi fist and weapon, and Baji. Master Shi Xing Jun, 44 years old, a 32nd generation Shaolin warrior monk, ranked at level 7. He specializes on traditional Shaolin fist and weapons, Shaolin 72 secret skills, and Chinese accupuncture. The location of Kungfu Xinglin is at a Buddhist temple named Er Zu Temple(Second Ancestor's Temple). Located in Sikong Mountain, the First Mountain of Chan Zong(Chinese Zen), Er Zu Temple has a history of over 1500 years and covers an area of 90,000 square meters, which offers a unique environment allowing students to enjoy the special atmosphere and absorb the essence of Chi(Qi) and Kung Fu. The temple is well equipped for training and cultivation, including training hall, fitness equipment, meditation hall, tea room, multimedia classroom, and library. We are able to use all the facilities and there is no prohibition for us to use most of the outdoor space in the temple to do training. Kungfu Xinglin attaches great importance to food quality at the academy. They carry on rational diet principles and the meals are served in traditional Chinese style. For breakfast, they offer oatmeal, milk, eggs, fruit, and bread. Lunch and dinner include vegetables, fruit, rice, and soup. They also offer Chinese dumplings, noodles, or special local food at least once a week. The food is vegetarian following Buddhism culture. Please let them know if you have any needs towards food, they will cater for it. Kungfu Xinglin offer optional courses such as Chinese medical acupuncture and massage, Chinese tea ceremony, Chinese Mandarin class, and Buddhism theory. They are for students to understand Chinese culture and also enrich their life at the academy. Some students may choose to visit the places nearby or have a short trip to some places of interest. There is a natural hot spring in the nearby city and it's a very good place to go on weekends after one week's training. Some places of interest are not far from the academy and are good choices for students to take a trip on weekends, such as the Sikong mountains, Tianxia valley, and Mingtang mountains. There is a small town within walking distance where you can find supermarkets and restaurants. There are buses going to the city, which takes about an hour to arrive. Please book your flight to Beijing, Shanghai, or Guangzhou. The nearest airport to the academy is Wuhan Tianhe International Airport (WUH), which is situated around 220 kilometers from the academy and has domestic flights from Beijing, Shanghai and Guangzhou. If flying to Beijing,Shanghai or Guangzhou, you could also take the train to Wuhan. Please send your arrival details to Kungfu Xinglin so they can send an English translator to pick you up on your arrival. It is also possible to be picked up from Wuhan Tianhe International Airport (WUH). Airport: Wuhan Tianhe International Airport Airport transfer available: Wuhan Tianhe International Airport (US$200 per person) Additional charges may apply. You can request this in the next step. Kungfu Xinglin is an authentic martial arts academy that teaches Shaolin Kung Fu, Wing Chun, Tai Chi, Qigong, and Baji Quan.